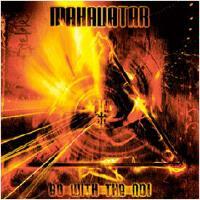 This is the first album from New York band Mahavatar, and it shows a LOT of promise for great things to come. They have created an intriguing blend of numetal, classic metal, epic neo classical metal and a good many other sounds. The effect is fairly unique. While one can hear moments that feel like such artists as Fight, RockBitch and even Guns N Roses, the combination of these sounds create a new soundscape that is definitely interesting. I wouldn't say that the album is a favorite of mine, but it definitely has some strong songs, and shows a lot of promise for great things from this outfit. If you are looking for a new heavy listening experience - give them a try. I'll bet you, like me, will be anxiously waiting to see what they do next. You can get more info or order the disc from their website, www.mahavatar.net. The main riff on this reminds me a lot of "Into The Pit" by Halford's Fight. The vocals throughout much of the track are somewhat in the vein of RockBitch, but a later segment feels somewhat like more recent Marianne Faithful. There is a very nice guitar duel on this one, and some strong classic metal sounds emerge later. This is a cool track and a great opening number. Bass and drums open this one, and eventually the guitar flits overtop. This cut again feels rather like Fight. A different segment brings in those more classic metal tones again. There is more melodic vocal break here that I can't decide if I like or not, but it resolves out into something that feels a bit like Guns N Roses, then a spoken word vocal segment enters. This is a fairly diverse and cool song. Starting with a rough shouted vocal line and a burst of music, as this kicks in fully it feels like a pretty typical and heavy numetal cut. They drop it down to an intriguing acoustic driven segment later that has some cool sung vocals. This segment works quite well. Eventually they jump it back up to the section that began it, then move into a weird, but very cool section that combines noisy guitar and processed vocals overtop of the background. They resolve it back out to the numetal stuff, then back to a stronger version of the acoustic section. They pull it out this time into a heavy and very powerful classic metal sound. A short neoclassical epic metal movement ends it. This is another exceptionally diverse track. Bass starts this one, and it jumps up into a hard-edged anthemic metal mode. This is another where the vocals feel to me like modern Marianne Faithful. The musical arrangement here gets pretty intense and prog metalish. This has a numetal sort of feel and is not all that special despite a catchy chorus and some fairly tasty guitar textures. The unique and dramatic segment that starts this is a nice change of pace. This is kind of a dark gothic balladic number driven by the bass. The mode lasts for a time before burst it up into metal fury. The main riff from the earlier segment emerges, and as they redo it into a harder edged segment this is pretty awesome. A funky bass line starts this cut, and it builds into a quirky hard-edged number that is quite unique. Mellow Eastern tones start this, and the first vocals come over top of this. They run in this mellower mode for quite some time before finally bringing the fury. The dramatic heavy texture here, along with the alternating awesome mellower segments are incredible. This stellar song is my favorite of the disc and a great conclusion.